Aquinnah - Until recently, the Town of Aquinnah had been known as Gay Head. The name Gay Head was thought to have been given because of the multi-colored clay cliffs at its head that spill into the Atlantic. 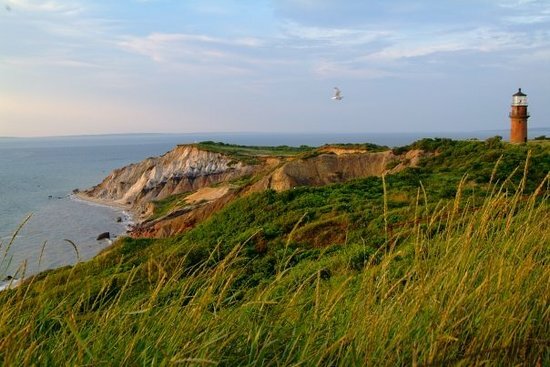 The name was changed back to its original Indian name of Aquinnah in 1998. Many descendants of the original Wampanoag Indians still reside in Aquinnah. The clay cliffs for which the town is known were created by glaciers during the Ice Age. There have been many fossils found as the cliffs have eroded over the years, however, it is now illegal to remove clay or anything else from the cliffs for fear of causing permanent damage to this magnificent natural formation. In addition to the breathtaking views of the Gay Head cliffs, Aquinnah has many beautiful vistas. One of the first lighthouses in America was built on the cliffs of Gay Head in 1799. The Gay Head Lighthouse is the most scenic lighthouse on the Vineyard and offers amazing views and public tours in the summer. Adjacent to this iconic structure is Lighthouse Park. The town is surrounded by some of the most picturesque beaches on the island. Philbin Beach, a private surf beach for town residents only, provides gorgeous views of the Atlantic Ocean. The public Moshup Beach, also known as Aquinnah Beach, is located off Moshup Trail and has lovely views of the Aquinnah Cliffs in the background. Lobsterville Beach, also open to everyone, is a popular place for fishing and bird watching. The Gay Head Moraine is a Land Bank preserve with beautiful meadows, woodlands, and wetlands. The trailhead is located off Lobsterville Road and people enjoy hiking, biking, dog walking, bird watching, and horseback riding. Sailing and kayaking are some fun water activities on Menemsha Pond. Biking is a popular among residents, although many of the roads are steep and winding. The Outermost Inn & Restaurant is one of the most popular fine dining options on the island. Located on the cliffs, the backyard patio and deck provides spectacular water views and sunsets. The Aquinnah Shop Restaurant, also on the cliffs, is one of the oldest restaurants on the island. The restaurant has indoor and outdoor dining and features seafood, American, and Native American dishes. The Aquinnah Circle Cultural District has local arts and cuisine and its restaurants and shops are owned by Wampanoag tribal members. Beautiful parks with picnic areas and hiking trails are also in the district. Aquinnah is located on the western-most point of the Vineyard. Search current real estate listings in Aquinnah.